Experience the diverse wildlife and stunning scenery of Auckland’s Hauraki Gulf Marine Park. See whales, dolphins and seabirds and spectacular island scenery. 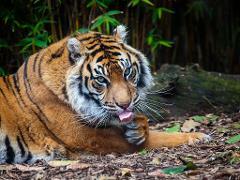 You’ll also learn from experts working to protect this incredible resource. Sample the latest vintage & relax in the rejuvenating atmosphere of our Matakana wineries – purpose built for optimal wine tasting enjoyment. Since 2007 we've introduced guests to boutique wines, known for character, diversity and passion. Discover inspiration for your own creative interests or simply enjoy a fun day out with friends on a Gardens and Art Tour. 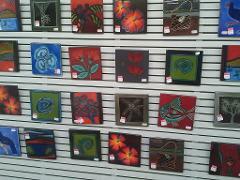 Embark on a journey deep into the world of our talented local artists and green fingers, soaking up their art works. Auckland Jet Boat Tour’s vision is that our customers get to share the many amazing sights of the Auckland City and Harbour Area, all from a unique on-the-water perspective. We are proud to welcome all visitors as they step aboard. Tasting NZ craft beers & bar snacks walking from bar to bar with a local guide. 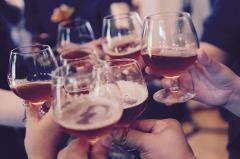 Meet the people behind the inner city's bar scene and taste your way through the ever changing local micro brews. Includes NZ beer history commentary. 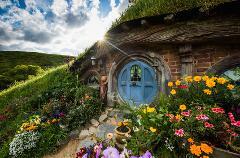 Hobbiton Movie Set full day return trip tour from Auckland. 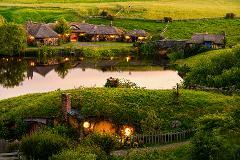 See one of New Zealand's most famous attractions, the magical Hobbiton Movie Set on this fully guided small group tour. Famous from The Lord of the Rings and Hobbit movies. 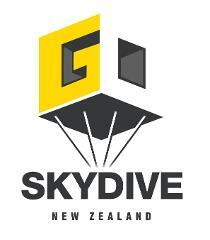 See two of New Zealand's most famous attractions in one day! 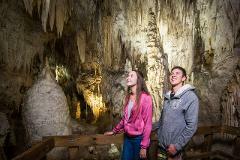 The magical Hobbiton Movie Set and the breath-taking Waitomo Glowworm Caves on a fully guided, small group tour. 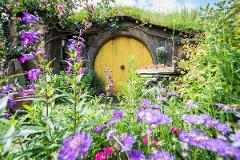 Experience the world-famous Lord of The Rings Hobbiton Movie Set plus the geothermal and Maori cultural wonders of Te Puia all in one day. 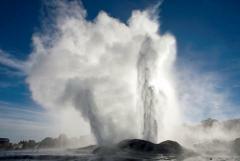 This unforgettable combo tour takes you to two of the top tourist attractions in the North Island. Experience the famous Lord of The Rings Hobbiton Movie Set and the geothermal wonders of Wai-O-Tapu (rated one of the most surreal places on earth). This unforgettable combo tour takes you to two 'must see' NZ attractions in one day. Visit two of the North Islands most popular attractions in one day - Waitomo Glowworm Caves and Te Puia Geothermal Park and Maori Village in Rotorua. This tour combines the best nature has to offer with Maori culture & New Zealand scenery. One day tour from Auckland to Pakiri Beach to enjoy 1hour safe and exciting horse ride on the stunning white sands of this private and deserted beach. 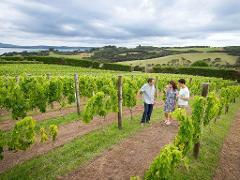 Add a wine tasting experience to top of a magical day. One day combo tour from Auckland to one of New Zealand's best sheep shows and farming experiences, Sheep World and a horse riding experience on the stunning white sands of Pakiri Beach. 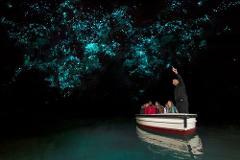 One day tour to the World famous Waitomo Glowworm caves from Auckland in small groups. Glowworms are unique to New Zealand for over 120 years, Waitomo Glowworm caves are a must see for any traveler. 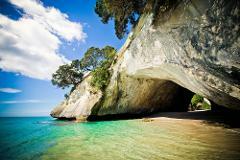 This one-day tour to Coromandel from Auckland will leave you feeling like you just found paradise. On this trip you will visit the famous Cathedral Cove from the Narnia movies, and Hot Water Beach for some natural spa-on-a-beach time. Experience the famous geothermal wonders and Maori culture of Te Puia as well as the stunning city of Rotorua and its famous sights all in one day, combining the best of New Zealand's natural wonders and Maori culture in one tour. Experience the world-famous geothermal wonders of Wai-O-Tapu (rated one of the most surreal places on earth) plus the stunning city of Rotorua and its famous sights, all in one day. The ultimate Poor Knights Day trip for a perfect day out on the water exploring the amazing World Heritage site. Lunch and all equipment supplied. Tour from Auckland in small groups. Would you like to learn about sheep farming in New Zealand and experience one of New Zealand's best sheep shows? This Sheep world tour will exceed your expectations. Hobbiton, Waitomo Caves, Rotorua, Huka Falls & Taupo! 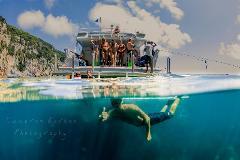 Fully guided small group tour to all the favorite locations in the North Island. A tour not to be miss or fantastic couple of days away. A Same Day Pass can use on any day within 3 months of purchase.